The Inventory page serves as a virtual deposit of access points which you are not using in the Linksys Cloud Manager. 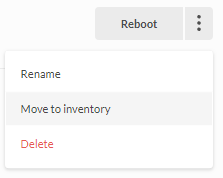 Click on your account icon at the top-right side of the page and select Inventory from the drop-down menu. NOTE: In the example below, W is the account icon. IMPORTANT: Make sure your access point is connected to the internet before adding it to the Inventory page. Click on Add new access point. 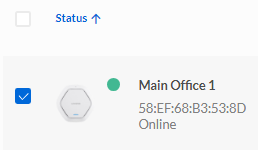 QUICK TIP: If you have previously added an access point, you will see the Add access point instead. Enter the MAC address and Serial number of the access point you want to add then click the Next button. NOTE: The access point's MAC address and Serial number can be found on the backplate of the device or on the box it came in. Once the device has been found, rename it and click the Add access point button. On the Linksys Cloud Manager dashboard, click on your network name. Select the Access Points tab. 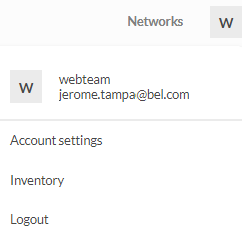 Click on the ellipsis icon of your access point and select Move to inventory. 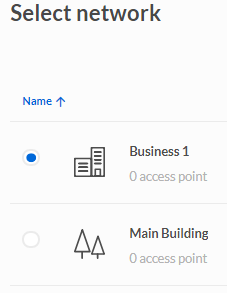 On the Inventory page, tick the box of the access point you want to move. Select the network where you want to place the access point.